In this second guest post about the recent Dark Mountain festival, English lecturer and blogger Abbie Garrington welcomes the move from 'manifesto to differently-imagined manifestation'. As Benjamin Morris's post yesterday made clear, the Dark Mountain manifesto has caused some controversy since its launch nine months ago. The most widely-read response has been George Monbiot's, with the comments facility beneath his Guardian article attracting many more queries about just what Dougald Hine and Paul Kingsnorth propose and why. Solitaire Townsend's more recent address to the issues brimmed with frustration. 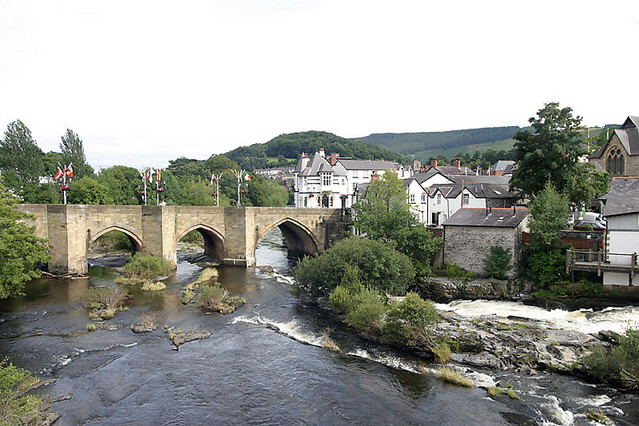 It is testament to the broad church approach of the Dark Mountain project, and the hospitality of its hosts, that many of these doubters and critics were compelled to make the trip to picturesque Llangollen (pic) to find out more at the Uncivilisation festival that was the result of this nine-month ideological gestation period. The decision to stage a festival which extrapolated upon and defended the ideas behind the manifesto was a bold one - it is far from easy to make the transition from manifesto to manifestation, to see the necessarily artful language of an attention-grabbing piece find some kind of expression in a gathering. Dougald and Paul's welcome to the festival acknowledged the accusations of their critics, admitting that their own position had been refined and re-worked in the time since writing. While others saw this as a weakness, the authors suggested it was a strength, demonstrating the flexibility of a manifesto that responded to the ecology of the ideas that gathered around it, rather than standing rigid in the manner of a political tract. With its emphasis on the role of art in the revolution of human thought (and with its origins in many hours of pub discussion) the Dark Mountain manifesto owes more to the -ists and -isms of the early twentieth century than to the political pamphlet tradition. The invitation to Llangollen was intriguing as a result - to what cause, exactly, were we rallying? One of the most interesting aspects of Uncivilisation's rather ragged gathering of thinkers, writers, artists, musicians, philosophers, activists and foragers (see the programme here) was the terminology which accrued over the course of the weekend. With a controversial manifesto hovering over our activities, this was perhaps inevitable. The terms which recurred throughout were: conversation, stories, community, sustainability. These were the positives. The negatives were more nebulous, largely being described as "the economic machine" or the "capitalist economy." What conversations and stories might do to address the problems of such a machine, particularly given the rather worn-out and empty language of environmentalism in evidence at this very festival, was unclear. The somewhat sarcastically posed question which has dogged the Dark Mountain project is that outlined by the title of John Felstiner's recent book: Can Poetry Save the Earth? The question is designed to evoke David and Goliath images - haiku vs. the Bank of England, limerick vs. oil slick - but it is one which the Dark Mountain project has put back on the agenda. The terms of the manifesto may be contestable, the language of the festival may be tired and old, but the project leaves open the possibility of Seamus Heaney's concept of the 'redress of poetry' - the imagining of a world which is at once separate from and contiguous with our own, and which imagines things differently. The common root between 'manifesto' and 'manifestation' indicates that the former will bring into being, make manifest or evident, through the power of declamatory language. This is not a world away from the sorcery that Heaney ascribes to poetry (there too in Don Paterson's description of poetry as the 'dark art'). Whatever the flaws of the project, hats off to the Dark Mountaineers for their first bold step from manifesto to differently-imagined manifestation. Abbie Garrington blogs at springcoppice, leads environmental expeditions with BSES (of the Royal Geographical Society) and, having taught English literature at Edinburgh University for several years, is about to take up a lectureship at Newcastle.